The Soundmagic E10 headphones have long been a recommended choice for an affordable pair of in-ear headphones. These were then followed up by the superior E11 which offered full aluminium construction, updated drivers and a high-resolution silver-plated audio cable make for a robust build and enhanced audio performance. These headphones have now been given the Bluetooth treatment, making them more useful for a generation of phones that lack the 3.5mm port. 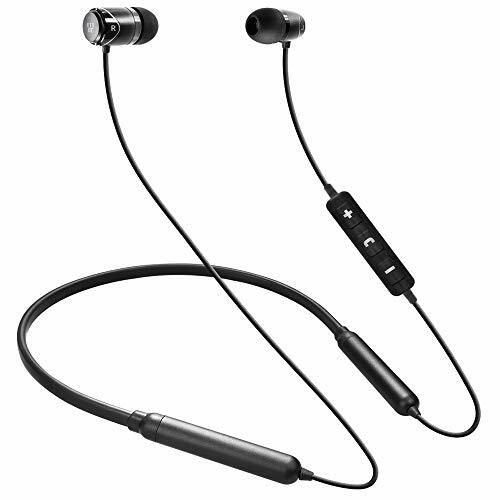 Priced at £69.99, they are affordable albeit not a cheap pair of earphones that features a neckband for comfortable use and use Bluetooth v5.0 for an improved connection with compatible phones. The E11BT is also AAC compatible – the high-quality codec used in current Apple and Android devices and they come with a 24bit DAC installed. The neckband style allows Soundmagic to fit two small batteries on either side and this provides an impressive 20 hours of playback when fully charged. The controls are located on the left ear with the usual functions that are compatible with Android and Apple, and they use a microUSB to charge. Sadly, there is no IP rating for these meaning they will not really be suitable for exercise. This is a shame as the overall design looks like they would work OK for the gym, and it doesn’t look like it would take much work to make them waterproof. The neckband and batteries are well sealed, and the microUSB port has a cover so I suspect with a little more engineering they could have easily got a basic rating. I am a big fan of the neckband style as it allows the bulky components to rest on your neck and shoulders leaving the earpieces to sit in your ear unencumbered. These do have the control on the wire below your left ear, so there is a little additional weight, but I did not find it tugging the earpiece out. The design and build is lighter and smaller than both the 1MORE models I have reviewed which make them a little more convenient to wear and carry around. For me the earpieces fit well, providing a good seal which helps immensely with audio quality. Not quite as good as the 1MORE models, but better than the RHA MA750 which is also a neckband style headphone. In-ear fit is highly user dependent so what works with me may not be the same for you. The earphones are equipped with single 10mm Neodymium dynamic drivers with a sensitivity of 100dB and a frequency range of 20Hz – 20kHz which is then complemented with the 24bit DAC. The sound quality is impressive, and they offer a familiar audio profile to the wired versions. There is a prominent amount of bass without being overbearing with a strong, clear middle. Treble was also well represented, and the combination of the strong mids and treble allows this to perform well with vocals, strings and percussion. The bass allowed these to perform well with more aggressive types of music including metal, hip hop and electronica and I found these a fun pair of headphones to listen to. The overall sound quality and profile is not dissimilar to the superb 1MORE earphones, and I would say they are slightly better than the similarly priced 1MORE Spearhead but perhaps not as good as the more expensive 1MORE Triple Driver BT. I have not put the battery life to a full test yet, as I generally charge earphones after using them, but 20 hours makes them the longest lasting pair of in-ear Bluetooth headphones I have reviewed. The built-in mic works well for making and taking calls, it is not something I go out of my way to use but if a call comes in while listening to music they work well. SoundMAGIC has taken the superb E11 earphones and made them wireless, it is about as simple as that. They have done it without messing anything up, and even managed to outdo themselves with the fantastic battery life and Bluetooth 5 support (which aids with the battery). Build quality is superb and I they feel like they shouldn’t encounter any issues with their durability. They cost £20 more than the wired version, or £10 more than the USB-C option, which does push the price up to the top end of what I would class as affordable, but I think they justify this price with the overall features and audio quality.